Setting up, managing and maintaining a global eCommerce store in Magento just got a lot easier! TranslateMedia has developed an extension for Magento that allows you to send content for translation from the Magento admin panel directly to our translation management system, STREAM. This allows site owners using Magento to free themselves of the burden of manually exporting, or even worse, copying and pasting content from their site to send to their translation service provider. The extension takes minutes to install and set up and once configured, allows you to send content of various types straight to TranslateMedia for translation without having any technical expertise or needing to worry about how to import the content once it has been translated. Once the TranslateMedia Magento extension is installed, users are presented with new options for translation within the “Manage Products” page in the “Catalog” section of Magento as shown below. Here you can either select all untranslated products or products that have been modified since they were last translated – or simply select the individual products you’d like to translate, along with the target language and specialism. Once you click on send for translation, the products are automatically sent to TranslateMedia for translation. As well as translating products, it’s possible to send your categories for translation from directly within the Magento panel. 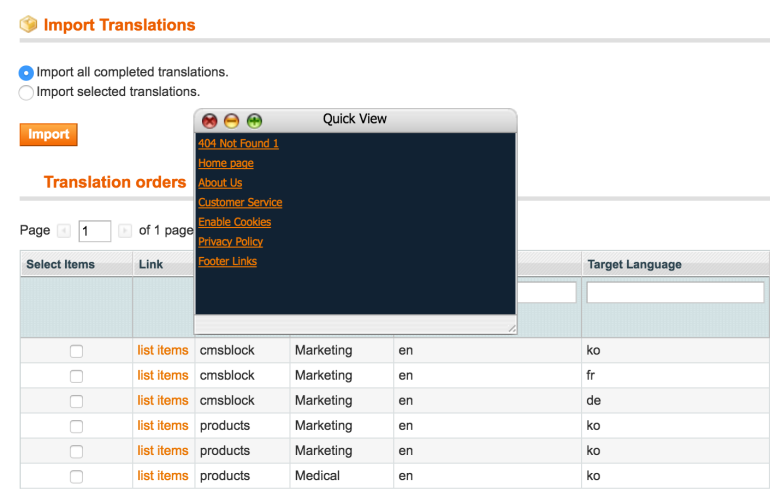 Once installed, some new options for translation management appear in the “Manage Categories” page within the “Catalog” section of Magento as shown below. As with products, it’s possible to translate all untranslated or modified content in one request. Users also have additional functionality which allows them to specify whether they would like to translate the category name, description, title, meta description and keywords as well and whether they would like to translate those items for all subcategories. It may be necessary to translate attributes in order to localise your Magento store for users in different markets. The TranslateMedia Magento extension also offers the ability to do this with new options for translation appearing above the attributes table in the “Manage Attributes” page under “Catalog” in the Magento admin panel. As well as offering the ability to translate categories, products and attributes – in order to communicate effectively with users in global markets, you’ll need to ensure that your pages as localised for users in these markets. So we’ve included the ability to translate content such as CMS pages and CMS blocks in our Magento extension. 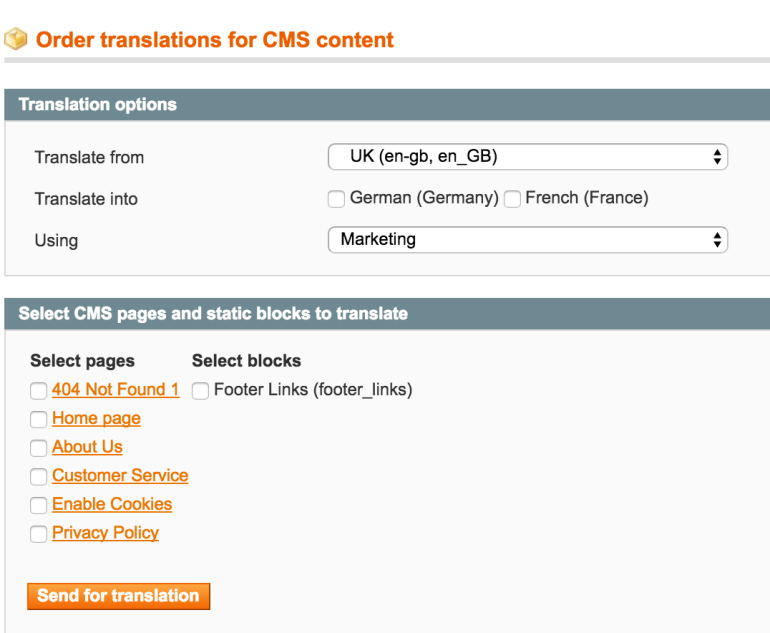 Once the TranslateMedia Magento extension is installed – the translation options for CMS pages and blocks appear in the main navigation menu under a new option labelled “Translations”. Within this tab, a new page will appear labelled “CMS content translation” on which it’s possible to select any pages or blocks that require translation and send them to TranslateMedia as shown below. The TranslateMedia Magento extension also offers the ability to check on the progress of your translation jobs and once jobs have been completed, allows you to import these directly into STREAM. Once installed, a new page labelled “Manage translations” can be found under the “Translations” menu in the Magento admin panel which allows you to view and import completed translations. Jobs are listed according to type e.g. product, cms block, category etc. as well as source and target language but also status – allowing you to filter and import jobs individually or simply batch import all completed translations. By clicking on “list items”, it’s possible to get a detailed view of the specific content items (e.g. products, pages, categories etc. included in the specific job). Once imported, the translated content is automatically placed in the correct place within your website, store or store view depending on the configuration of your site. Translating content for use in a different geographical territory and publishing the localised content to your eCommerce store may not be enough to gain exposure on search engines in your target market. Your pages, products and categories will need to be optimised for the most searched for key terms in the target region and language. As part of our service, we can offer keyword research to identify high-volume terms in the target language and apply international SEO to your products and pages before returning them to your Magento store for publication. We can also offer a full technical SEO audit, PPC keyword localisation and even manage your digital marketing campaigns to ensure you achieve the best results from your localisation project. While we have a robust solution in place for translation management for users of the Magento platform, eCommerce retailers tend to choose TranslateMedia because of our high levels of service and the quality of our translations. We employ an extensive database of qualified linguists to translate the different components of your eCommerce site. For example, we would not expect a person who was translating brand-led product descriptions to write the legal terms and conditions – each requires a different linguistic expertise. For full details of our service or to speak to a representative, please use the contact form below.